While it is possible to control the spread of bamboo with easier methods, a bamboo barrier is the longest lasting and lowest maintenance method of containing aggressive forms of bamboo. Bamboo rhizomes can be very strong, and they have a sharp tip when growing. Concrete will crack over time and allow the bamboo to escape. Metal will eventually rust through, and poses a hazard where it must stick up above ground. For best results, only a true HDPE (High Density Polyethylene) barrier of at least 40 mil thickness will suffice for the long term control of bamboo. Thicker plastics like 60 mil and 80 mil are also available for additional protection. You'll also need to determine the height (or width) of the barrier. 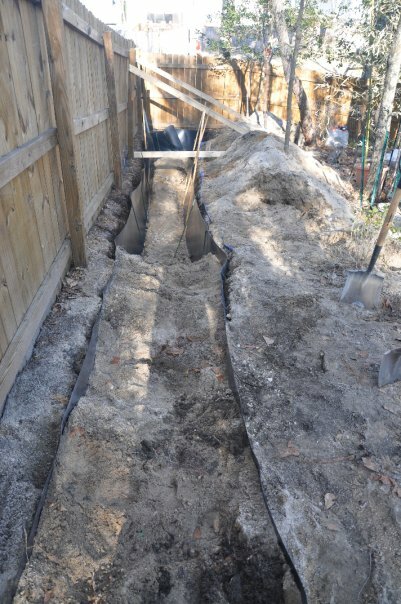 In hard clay soil, some professionals say it is okay to use only a 24 inch wide barrier. However, a 30 wide barrier is safer for most soils. 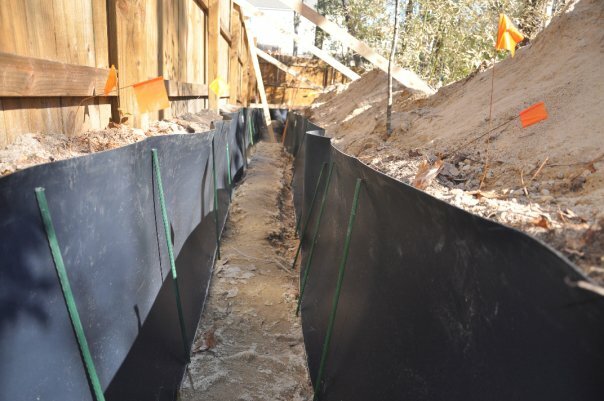 For areas where the soil is sandy and loose, a 36 inch wide barrier may be required. Remember, the greater the width, or height, of the barrier, the deeper you'll have to dig. Only the last two inches of the barrier will be present above the ground. 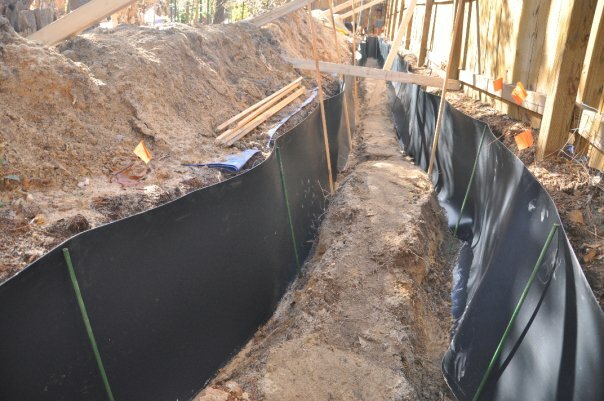 Because we live in an area that has sandy soils, we selected a barrier that was 30 inches wide and 60 mil in thickness. The 60 mil may have been overkill, but it never hurts to be safe with bamboo. You can find these plastics online from several sources, or you may be able to find it locally at a nursery or garden center. On the following pages we will go over the steps to install a bamboo rhizome barrier. 1.) The first step is to determine the area you want to contain the bamboo in. 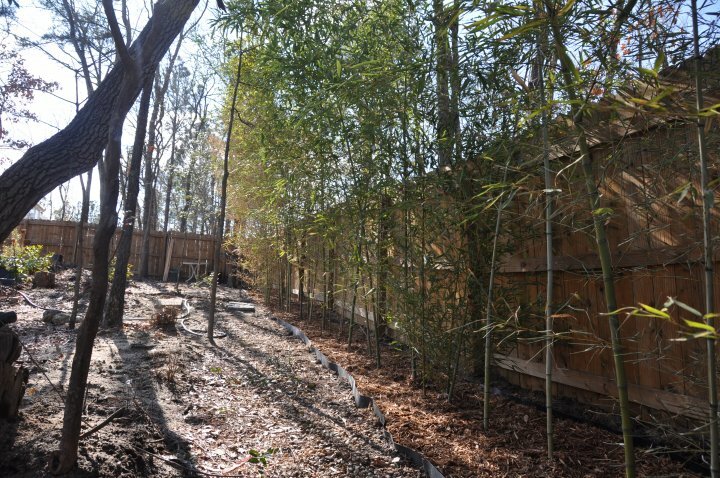 The larger the area, the larger your bamboo will be able to grow without overcrowding or choking itself out. Those focused exclusively on the vigor of bamboo recommend as much as a 30 ft. diameter for large species. However, it is possible to have a reasonably large healthy plant with as little as 3ft x 3ft of ground for it to grow in. Our barrier, seen in the photos throughout this entry, was an elongated barrier measuring approximately 60ft long by 3ft wide. 2.) Next you'll need to dig the trench all the way around the area to be contained, about 2 inches shallower than the width of your rhizome barrier. 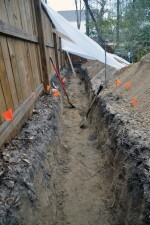 If you are digging an especially narrow trench, like we were at 3ft, then you may have to dig out the entire area. 3.) 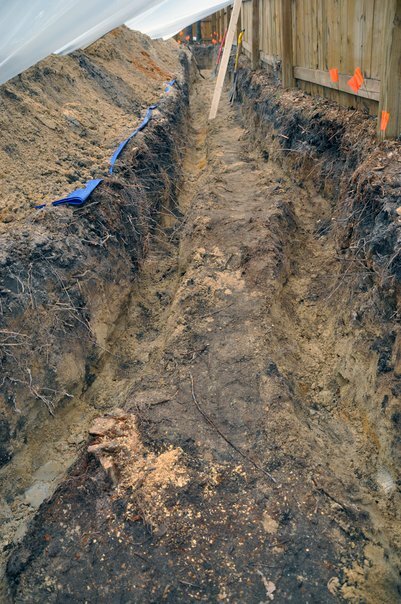 Be sure to remove all roots and other objects that protrude into the trench where the barrier will be located. 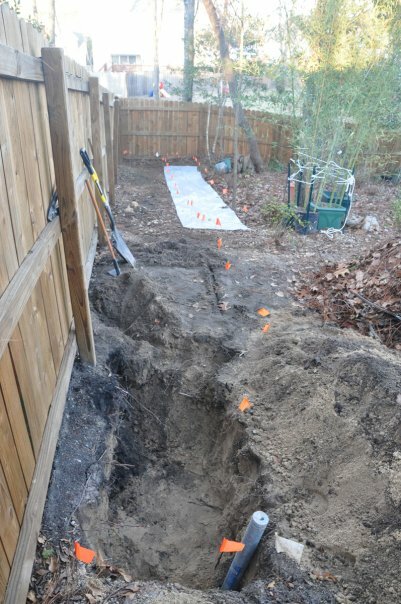 Once you dig out the proper depth, you'll also want to compact the bottom of the trench as well as possible. You want this bottom layer to be a hard and uninviting clay in the event a rhizome ever makes it down that far. 4.) 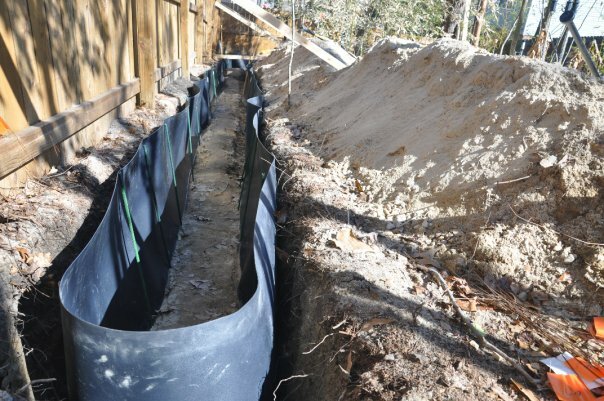 After you've extracted all of the dirt from your trench, and compacted the soil, you can begin installation of the barrier. Place the barrier into the trench and position it where you want it to be. It's important to try and angle it away from the enclosed area, approximately at a 15 degree angle if possible. The idea here is that you want any rhizome that hits the barrier in the future to be directed up and not down. This will allow you to snip it off when it reaches the surface. You do not want the rhizome to go down, as this can lead to a rhizome escaping under the barrier. Remember to leave at least two inches above the top of the trench. This will allow you to inspect for rhizomes a couple time a year. 5.) Next you'll want to close the ends of the barrier. Either use steel closure strips with a less than 3 inch overlap (which we recommend), or overlap the ends by at least four feet and seal the overlap at both ends with double sided tape. Bamboo can escape through very small openings, so make sure the seal is really good and tight. If you want to use the strips but can't find anyone to purchase them from, you can make your own quite easily. Go and buy two metal steel rulers, that are at least as high as your barrier, and drill holes in them every 3 inches or so. Then take your screws and install on the barrier. Make sure all the holes drilled in the barrier line up with the screw locations - do not leave any open holes where the bamboo rhizomes might escape through. 6.) Finally you'll begin filling in the barrier. Keep the barrier angled outward at the 15 degree angle we spoke about earlier. Pack the bottom half of the trench as tightly as possible. Let the top half remain loose since you will be planting in that portion of the soil. 7.) Now that you're barrier is installed you can plant your bamboo. Your bamboo should not be able to escape underground. It will eventually send rhizomes over the 2 inch high above-ground part of the barrier. However, these are easily spotted and clipped with a quick inspection once or twice per year. 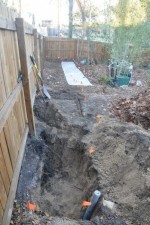 Try to keep the topsoil and subsoil separate when digging the trench. 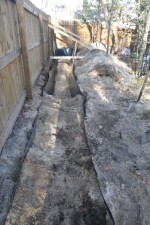 Then, when filling the trench back in, use the subsoil for the bottom half, and the topsoil for the top half. This will help make rhizomes less likely to go down, because the low nutrition content of the subsoil is relatively uninviting. Also, add 2 inches of mulch all over within the barrier. Not only is this really good for bamboo, but it will also encourage the plant to keep its rhizomes near the surface. Also be sure to check out our growing tips for hardy bamboo. Thanks so much for this! This is exactly what I was looking for. What kind of bamboo did you plant. THanks for the great write up!!! Hi, we've planted two types of Bamboo using this method. Yellow Fishpoll Bamboo and Black Bamboo (nigra). It has worked well so far on both varieties. We'll know for sure in the coming spring seasons how well this method works, as by then the bamboo should be much more established. I was wondering if it would be ok to cross 2 species together. From what i have been reading it looks like it would be ok. Finishing up digging the trench today and hopefully have the bamboo in this weekend. Cant wait! Im using your pics as refferance! Also how tall is your bamboo now? You can cross species but be sure to check how aggresive certain species are before planting them together - else one might choke the other out over time. I planted some Nigra with the Fishpole bamboo and I'm pretty certain one of those is going to choke the other out in places. The tallest stalks we have are near 25' because we transplanted a lot of them. But the new shoots this spring (and we were lucky to get any bc of the transplanting) got to about 10-15' max, but most barely got to 6' or so. Next year I expect to get 20'+ stalks, and then hopefully by year three we'll get full stalks growing. After that I'll probably have to prune a bit since my trench was so narrow - else they'll become rather rhizome-bound within a few years. This is such a great resourcefulness that you are rendering and you give it wrong for free. I passion seeing websites that understand the assess of providing a excellent resourcefulness for free. It’s the old what goes approximately amounts around common. Caused you acquired deals of links and I regard lots of trackbacks?